What changes will make the 2020 Jaguar E-Pace different? Hopefully, a revamped cabin with materials befitting a Jaguar. That would help this five-seat premium subcompact crossover compete on a more even footing with rivals such as the BMX X1, Lexus NX, Audi Q3, and Volvo XC40. Introduced for model-year 2018, E-Pace is the revered British brand’s smallest, least expensive SUV and sits in the lineup below the compact-class F-Pace. Aiming for a youthful vibe, Jaguar gave the E-Pace sporty if understated exterior styling. Inside, it eschewed stuffy touches like real wood trim and filigreed surfaces for subtle aluminum accents and conservative, squared-off forms. Successfully integrating cues from Jaguar’s sports cars, the body probably won’t be altered before a midcycle refresh, likely for model-year 2021. But heeding criticism of the interior, the automaker could well replace some of the 2020 model’s sturdy but dull plastics and perhaps introduce more imaginatively contoured surfaces – maybe even offer optional wood trim. Should I buy a 2019 model or wait for the 2020? Buy a ’19 if you’re OK with the general interior design and realize the optional quilted Windsor leather upholstery — $1,500-$2,100, depending on model – dresses up the cabin considerably. Wait for the ’20 if you think the ‘19’s interior décor is less than you deserve and want to see if Jaguar makes changes. Wait for the ’20, though, and you risk paying more for a vehicle mechanically unchanged from the ’19. And while the potential model-year 2021 refresh won’t be dramatic, the ’20’s exterior styling details would have a shorter shelf life than a 2019’s. Overall, expect the ’19 E-Pace lineup to repeat for 2020. It should again feature the P250 grade with 246 horsepower in Base, S, and SE trim. Also back will be more expensive P300 R-Dynamic S, SE, and HSE grades with the same turbocharged four-cylinder engine hot-rodded to 296 horsepower. All versions of the ’20 E-Pace will continue will all-wheel drive (AWD) and a nine-speed automatic transmission. Expect the exterior to be unchanged, with a handsome Jaguar-family oval grille flanked by narrow LED headlamps. The tightly tapered rear roofline will return, as will knife-blade taillamps wrapped into crisply defined rear fenders. Look for the R-Dynamic line to be visually distinguished from the P250 roster via standard fog lamps, larger front air intakes, satin instead of chrome side vents, and color-matched trim instead of black for the lower body and rear bumper. A black contrasting roof should return as a roughly $400 option for all but the base model, as should a package of gloss-black exterior trim at a reasonable $220. Wheel size and design should also remain differentiators, starting with 17-inch alloys on the Base P250, 18s on S versions of the P250 and P300, and 19s on SEs of both. The P300 HSE should return with standard 20s, and all but the base P250 will again be available with wheels up to 21 inches as options ranging from $800-$3,000, depending on size and model. The SEs and the HSE should again be available with optional red brake calipers for around $400. 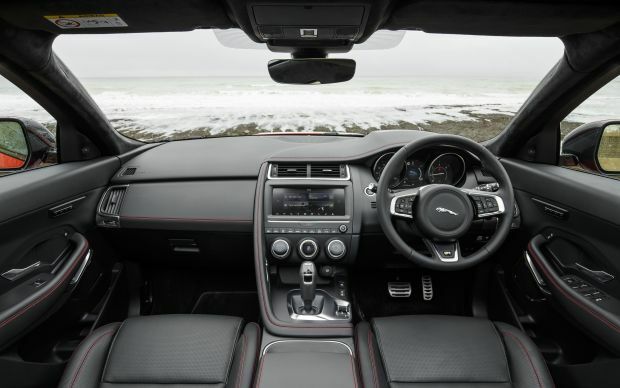 If Jaguar changes the cabin, it probably won’t alter the dashboard’s businesslike layout. All models will return with a 10-inch central-dashboard touchscreen that, on SE models and above, hosts a standard imbedded navigation system. Below are three simple climate-control dials. Standard will be a no-nonsense main instrument binnacle with clear analog gauges. Expect a 12.3-inch full-digital cluster to again be standard on the R300 HSE and optional at a reasonable $500 for all but the Base P250. It’s customizable for a variety of vehicle info, including 3D GPS mapping on models with imbedded navigation. The E-Pace will retain a conventional console-mounted transmission lever rather than adopting the rotary shift knob as on other Jaguars. None of this needs to change, really, although a faster-acting infotainment interface with more intuitive menus would make the ’20 E-Pace less frustrating to live with. And more artistic inlays and details on the dashboard and door panels, along with richer grains for their surfaces, would add some of the flourish for which Jaguar is known. The Base 250 probably will return with cloth upholstery and all other models with standard leather. The R-Dynamic line will again have sport-bolstered front seats and contrasting-stitched leather. The HSE should return with 18-way power front buckets and perforated Windsor leather as standard. The classy quilted Windsor and 18-way seats were an option package for the 2019 S and SE models, and Jaguar ought to consider extending that to the HSE for ‘20. Dimensionally, the ’20 E-Pace will remain midpack in a class bracketed in size by the Cadillac XT4 at the upper end and by the Buick Encore at the lower. Front-seat room is generous. The practical limit in back is two adults. They won’t be squeezed but shouldn’t count on space to stretch, and on entry and exit, they’ll need to negotiate the tapered trailing edge of the rear door. At 24.2 cubic feet behind the rear bench and 52.7 with the 60/40 seatbacks folded, cargo volume is among best in class. None likely, although that could change as early as the model-year 2021 refresh. Jaguar says that beginning in 2020, every vehicle in its lineup will offer with some form of electrification. Likely technology ranges from battery-powered motor assist to plug-in hybrid to pure electric. The last powers the automaker’s enticing new $70,000-plus I-Pace midsize crossover and Jaguar will likely reserve it for cars and crossovers built from the ground up as pure-electric vehicles. Given that, the 2020 E-Pace P250 family will return with a turbocharged 2.0-liter four-cylinder engine tuned for 246 horsepower and 269 pound-feet of torque. The versions in the P300 will again have 296 horsepower and 295 pound-feet. Steering-wheel shift paddles for the nine-speed automatic are standard on R-Dynamic models and optional on the P250 S and SE. 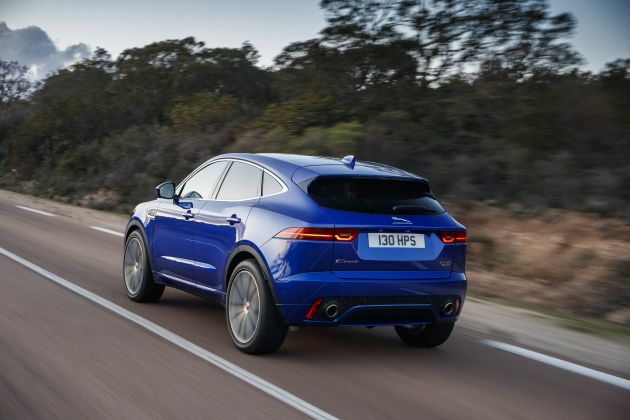 The ’20 E-Pace will remain far from the quickest crossover in its competitive set, but acceleration will be acceptable in the P250 range – 6.6 seconds 0-60 mph – and good in the P300s – 5.9 seconds. Turbo lag at low engine speeds prevents either from leaping off the line and robs both of quick throttle response in around-town cruising. But midrange thrust and passing power are up to snuff. Jaguar should, however, work to smooth out the automatic stop-start sequence this engine employs to save gas when the E-Pace is stopped. Again standard across the board will be four driver-selectable powertrain modes: Normal for everyday driving; gas-saving Eco that dials back powertrain response and the climate system; Dynamic that sharpens steering, transmission, and AWD response; and Rain/Ice/Snow to optimize these systems for slippery conditions. Expect all but the Base P250 to again be available with the optional Configurable Dynamics and Adaptive Dynamics packages for even more customization. With a carlike 6.4 inches of ground clearance, this is by no means an off-roader, but on-road handling is a plus. Steering is firm and accurate. Balance and grip are allies quick changes of direction. The E-Pace’s impressively solid structure helps, too, and makes this crossover really feel all of a piece on rough pavement. For best bump absorption, lean toward the 18- and 19-inch wheels and tires. The 20s standard on the P300 HSE and available on other models transfer some impact harshness into the cabin, a deficit magnified with the optional 21s. The E-Pace shares its underskin engineering with the Evoque premium subcompact crossover from Jaguar’s Range Rover/Land Rover parent company. As such, it’s based on a front-wheel-drive platform imbued here with AWD and Jaguar’s All Surface Progress Control that reduces anxiety in difficult off-pavement conditions by acting as low-speed cruise control. The 2020 P250 range will probably retain a basic AWD system that shuffles power front to rear depending on driving conditions. Expect the P300s to return with Jaguar’s Active Driveline AWD. Both systems will again be capable of directing nearly 100 percent of engine power to the front or rear axle as needed. But Active Driveline can also apportion power to an individual rear wheel to enhance cornering control. And during stead state cruising, it powers only the front axle to reduce parasitic losses. With powertrain unaltered, 2020 E-Pace EPA ratings should repeat those of 2019, leaving it competitive with rivals of similar power. Expect the P250 range to again rate 21/28/24 mpg city/highway/combined and the P300 line 21/27/23 mpg. Expect Jaguar to again recommend 91-octane gas for all ’20 E-Paces. There’s not much to add to an already comprehensive roster of standard and optional equipment, particularly after Jaguar filled a gap by adding Apple CarPlay and Android Auto as an option for model-year 2019 – at around $300. Charging extra for the popular smartphone interface isn’t very bighearted, and neither is charging extra to equip an E-Pace with more than just the basic driver-assist features. Lane maintaining automatic steering correction will again be standard on every 2020 E-Pace. So will autonomous emergency braking that can stop the crossover to mitigate a frontal collision with another vehicle or a pedestrian. For 2019, however, the braking system was designed to operate up to 50 mph. To get autonomous emergency braking effective up to 99 mph required the Drive Package, which was standard on the P300 HSE and a $970 option for other E-Paces except the base P250. The Drive Package also included blind-spot warning, as well as adaptive cruise control to maintain a set distance from traffic ahead, even in stop-and-go driving. We’d urge Jaguar to make its full suite of driver assists standard on every 2020 E-Pace. Beyond that, 2020 E-Pace buyers should want for little. The Base P250 isn’t likely to expand its options list beyond such features as heated front and rear seats ($1,020 for 2019), a leather steering wheel ($300), and satellite radio ($510 and optional on the P250 S and SE, too). The list of equipment available on other E-Paces will again be long. In addition to those mentioned earlier, available features – standard or optional, depending on model — will include a hands-free power liftgate, fixed panoramic moonroof, hands-free automatic parking, and automatic highbeam headlights. Also available will be an unusually comprehensive head-up display that can project adaptive cruise settings, blind-spot warnings and other data not typically included in such systems. Expect the Cold Climate Package to again add a heated windshield, heated washer jets, and on P250 S and SE models, an R-Dynamic leather steering wheel with gearshift paddles. For 2019, the package cost $795 on P250 S and SE models and $640 on P300s. Returning as well will be Jaguar’s innovative Activity Key, a waterproof and shockproof wristband incorporating an RFID (Radio-frequency Identification) transponder. Essentially, it’s a wearable keyfob designed for sports and leisure activities where carrying a conventional key is impractical. If Jaguar believes the E-Pace’s inartistic interior deserves a measure of blame, upgrading it for 2020 could force a price increase. So could expanding the roster of standard safety features. Here, we’ll provide some 2020 base-price estimates, noting that they include the manufacturer’s destination fee, which was $995 on the ’19 E-Pace. For the ’20 E-Pace P250 range, estimated base prices are $39,995 for the Base model, $42,300 for the S, and $44,800 for the SE. For the P300 range, estimated 2020 base prices are $47,700 for the R-Dynamic S, $50,400 for the R-Dynamic SE, and $54,250 for the R-Dynamic HSE. 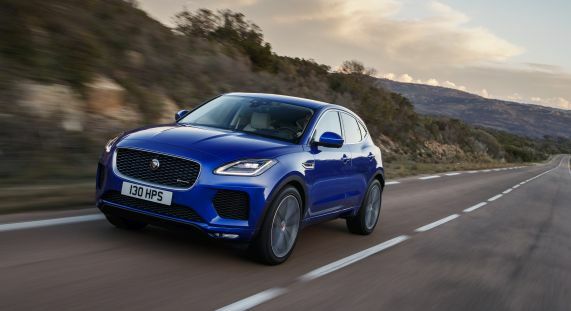 Look for a 2020 Jaguar E-Pace release date in the third quarter of 2019.